Thank You, Lord Jesus, for coming to us with Your Wisdom and gratitude. What a blessed people we are! Well, my dear family, these have certainly been weeks of uncertainty, but it seems that we are rounding a bend in the road. Several times during worship I found myself dancing with the Lord, my head on His shoulder, and He has been very present to me in such a sweet, sweet way. But then there are those moments of distance, as well. It almost feels like I must pull Him close to me, but maybe that's just because my mind is wandering. But the Lord's supper readings for today were about repentance, so much about repentance in the last few weeks. I have been in a spiritual doldrum for the entire week, really having to press in to stay connected to the Lord's presence, prayer, and repentance. I have to admit, I didn't do so well. He brings me into this very strange place of malaise, where my mind feels numb, my body feels like lead weights, and my emotions are totally disconnected and floating, so to speak. It's a form of intercession that I've experienced, oh, for at least 30 years. And I know it's always tied to intercession. It's like I can't press in with intention in any direction; I'm just floating on a cloud, my mind very peaceful and sleepy. I'm thinking about what I want to pray about, and sometimes I'm getting the words out, but there's just no passion there. This is really a peculiar kind of intercession, but He has done this with me for so many years, I understand what it is. It is a sacrifice, and very frustrating not to be able to concentrate on anything and feel completely exhausted. It feels so good when I can press in to pray with emotion--but lately it has been really bland. I wonder if my prayers are worth anything when they are like that. Have you ever asked yourself that? Jesus began, "Stop putting yourself down. There are times when your intellect seems suspended and so does your body, yet those are highly productive times when I take you to other places to minister. Don't worry, Clare. You do have a tender heart, and truly, being devoid of emotion is at times a suffering you must bear." And I want to say, with the Scripture readings about repentance, my tendency is to immediately take it personally. Jesus replied, "It is good to keep repentance in mind, is it not?" Yes, it is. But my knee-jerk reaction is to duck my head and hide. He continued, "We've settled those things that displease Me, Clare. I want you now to enter into My peace and allow Me to heal you from the damage you've done by your sins. I want you to rest in Me and find joy in working with Me. I've missed that, you know." (He's talking about music. ) Me, too. I've really missed that. "Good." He said. "Then we are agreed." And I just can't wait to get to my keyboard. And my vocal exercises. Jesus began again, "There is still a ways to go to get this country in order. Your President has had to pick his way carefully through many deadly traps in order to do what he is now accomplishing. Much has been done in the shadows and will be released to the public when they are ready for it. He is doing a marvelous job, and your prayers are working. "I want you all to shift gears at this point, and work on your ministries, as well as pray for the United States and President Trump. I want you all to be engaged in ministry, busy about My business, feeling productive as together we create, inspire, and draw all men to Me. There will be calls to intercession. For instance, today, to prepare for the State of the Union address. And they never give up trying to kill him, so pray protection for him and his family, always. Keep them covered. "At the same time, I want you looking more deeply into what your role will be until I come for you. I want you productive, but not so busy you cannot spend intimate time with Me. "Dear ones, nothing replaces My special time with you. Nothing. I need to be connected to you. And you need to be connected to Me; we need each other. This work that is being done is a group effort, because so many souls all over the world, from many different nations, are being impacted. Therefore, I need your commitment to pray when I nudge you, to spend time with Me when I touch your heart, to help others when you feel called upon to be there for them. These are the things that make up the habits of your daily life that lead to true holiness. You are both there for intimate moments, and dedicated intercession. "Many of you have been tossed to and fro by the crosscurrents of uncertainty. Yet with each of you, I have been working to stabilize your heart in the midst of threats to the nation and the world. You have learned well, My Brides, to anticipate the Rapture without tension or having to have details and timing. You have been seasoned to the point where you can work with the gifts I've imparted to you, while being aware that the Rapture truly could happen at any time. "Yet, I have given you a framework of two years to work within, and you will get much done if you trust Me and apply yourself. Your prayers have done more for the world than I could ever possibly communicate to you. The littlest prayer--because of who you are to Me, because you have dedicated your lives to Me and are obedient--the littlest prayer carries much weight, though you very often have serious doubts that you are making a difference. "In Ezekiel's vision, when the Heavens broke open, and Mercy descended and met with the massive amount of prayers for the repentant, dying. And there was nothing but darkness all around. When that broke open, he did not see great offerings, but multitudes of little offerings and prayers, like a cloud. "You will never conceive of how appreciative I am of your prayers and offerings. It is beyond you to understand the impact your littleness makes in a world full of indifference. Or to measure the effect you have on My heart by your littlest gifts, given voluntarily. "So, I want to encourage you. When you cannot make offerings, great offerings, little things matter greatly. And the more little things you offer to Me with a heart of love, the greater your capacity to give becomes. "I want you all to move forward now, full of confidence that your prayers and offerings have accomplished what I needed them for. And truly, you have set the stage now; a solid foundation that you can build upon for the salvation of souls. Cherish, cultivate, and apply your gifts each day and lean on Me heavily to accomplish your goals. For without Me, you can do nothing. 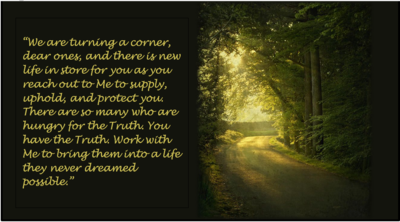 "We are turning a corner, dear ones, and there is new life in store for you as you reach out to Me to supply, uphold, and protect you. There are so many who are hungry for the Truth. You have the Truth. Work with Me to bring them into a life they never dreamed possible. "And I am with you wherever you go. Lean on Me in all circumstances and allow Me to show you how to reach souls."